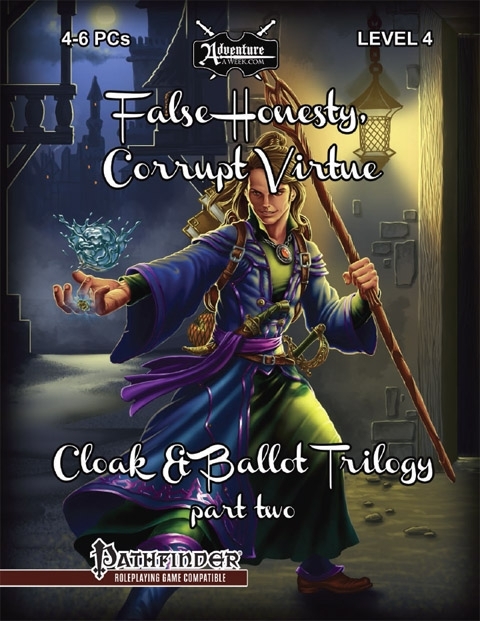 Cloak & Ballot Triligy Part 2: False Honest, Corrupt Virtue by AWW Games/Adventureaweek.com is now available for purchase. I did the cartography for this adventure written by Haakon Sullivan. A Pathfinder compatible adventure for four to six 4th level PCs. Continuing on from Tyranny of Greed, the heroes have just foiled an extortion racket run by a thieves' guild in the city of Rogail. 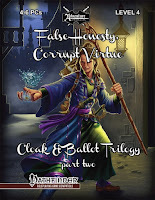 Now, in finding that the guild's rotting influence extends all the way to the mayor's office, the heroes have no choice but to fight their way through a hotly contested election filled with threats, violence, and mischief. On the way, they find out that there are other more sinister forces at work that can destroy all of Rogail's hard earned freedoms if left unchecked. Many new roleplaying opportunities for the PCs. More lore about the city of Rogail. A new monster, the horrible Terror Golem, that strikes fear into innocent bystanders. A new map set in the sewers of Rogail.